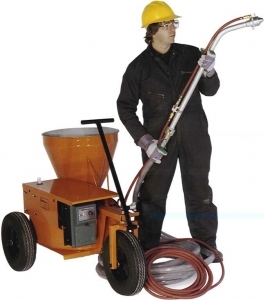 Mix, pump and spray most pre-blended cementitious construction materials with a single easy to use machine. Self-leveling underlayments and toppings, concrete repair mortars, grouts and fireproofing are all suited applications. The Carrousel Pump® is the application of the peristaltic or squeeze principle, similar to the human digestive system. The Carrousel PumpTM squeezes the material through its system, forcing material forward. The Carrousel Pump® has specially designed Quik-Flo couplings. These special couplings lower pumping pressures and horsepower requirement. The Carrousel Pump® can run dry indefinitely without damage, unlike the progressive cavity pumps or rotor/stator pumps. Parabolic hoppers are designed for easy flow of materials, and have no corners to clog. Specially designed 8-jet venturi spray nozzle for fiber filled coatings eliminates clogging and plugs. Cleaning is extremely simple. A sponge ball is inserted into the hopper, and is pushed through by the pumping action with clean water or solvent. Powerful constant torque electric, pneumatic or hydraulic motors are available. These powerheads allow for variable speed and application rates.